SmartKnitKids : Tired of hearing her son scream “these sock seams keep bugging me,” a mom decided something needed to be done. Every “seamless” sock her son tried had seams in it; there was not a truly seamless sock available. After explaining the frustrating morning routine to countless friends of her son’s struggles with socks, she was finally given the name of Knit-Rite, a textile manufacturer, and contacted them with her request for a seamless kids sock. 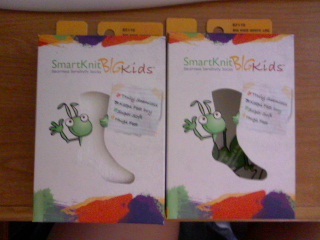 Rose at SmartKnitKids was kind enough to send me 2 pairs of their SmartKnitKids socks in white. Let me just say I love these socks! They are the softest run around socks ...EVER... when I got them I told my husband I could have a pair and he could have a pair. Well when I tried them on and relized how comfy and warm they are I told him you don't get a pair! He was like Huh Uh! Grow married couple fighting over socks..Thats how good these socks are! I would love to try more of SmartKnitKids socks! For me..(Cheesy Grin). Please ignore my white winter chicken legs! SmartKnitKids can be apparently worn as high water socks..LOL I took a picture like this just to show you how stretchy these babys are! But if you like your socks up to your knees ..well these would be perfect for you! If are like me and prefer your socks to be more to your ankle size you can roll them down and fold them over. My socks are super soft to the touch and the best part NO..S.E.A.M.S. *Angel harps starts to play*..I have had other so called "Seamless" socks in the past and well..They are in the past! 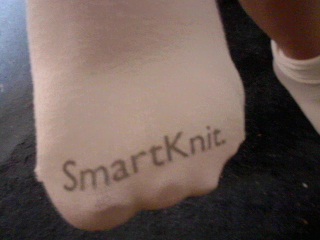 I don't think I ever want to own another pair of socks unless it's a SmartKnitKids brand! Not only are they comfy..But they will keep your piggies warm even in the coldest winter weather. You see that? .. My little piggies went to the market..this little piggie had roast beef..this little piggie .. well you get the point.. My toes are smiling! They have never been so comfy and secure in a pair of socks untill now. Thank You SmartKnitKids for sending Them..Err..Us! These Socks!.. You can find them here: SmartKnitKids. SmartKnitKids also have facebook Check them out! Facebook. ♥ I receive no monetary compensation for this review. I was provided socks to try and give my honest opinion.